Happy Thanksgiving from Hidden Brain! All of the research in this week&apos;s episode is geared toward helping you have a happier holiday, with tips to help you avoid three deadly Thanksgiving pitfalls: overeating, over-shopping, and fighting with your relatives. For appetizers, we&apos;ll start with two of Shankar&apos;s Morning Edition radio stories. First up, a story about political arguments at the dinner table, and why it&apos;s so hard for Democrats and Republicans to find common ground. Next, a story about why it sometimes feels good to not apologize. And finally, for our main course, we give you a delicious round of Stopwatch Science, chock-full of nutritious social-science insight from Shankar and Daniel Pink. In keeping with our Thanksgiving theme, Daniel and Shankar have some good holiday advice, with research to back it up. 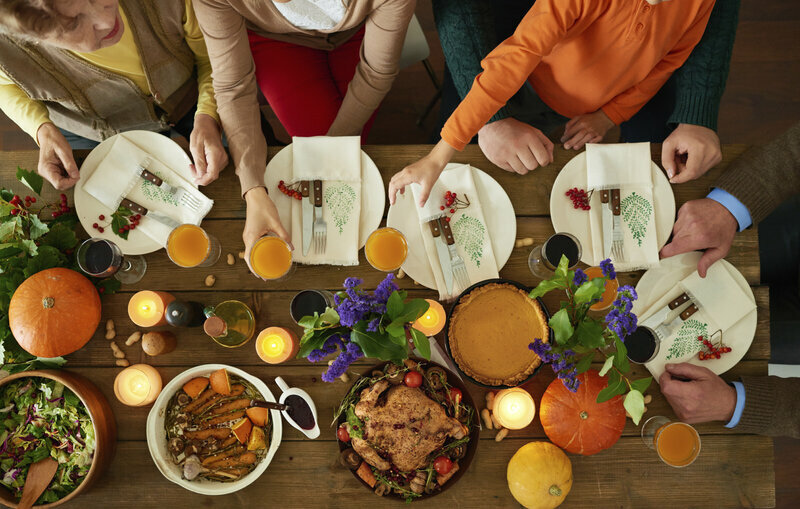 Hopefully these studies can help inform a healthier, happier Thanksgiving. We should shift from saying "I can&apos;t" to saying "I don&apos;t."
In the one of the experiments, undergraduates were trained to resist unhealthy foods by saying to themselves either "I can&apos;t eat X" or "I don&apos;t eat X." Later they were offered a choice between chocolate and a healthy granola bar. Of those using the "can&apos;t" self-talk, fewer than 40 percent picked the healthy snack. But in the "don&apos;t" group, nearly 2/3 chose the healthy option. What&apos;s going on is what linguists call "semantic framing." Different words give us different views of reality. "Can&apos;t" is disempowering. It implies someone or something else is in control. "Don&apos;t" is empowering. It implies that I&apos;m in charge of what I do and, ultimately, who I am. 2. Leaf Van Boven, George Loewenstein, and other colleagues recently analyzed a factor that could play a role in Thanksgiving table social breakdowns. It has to do with the concept of hot and cold emotions. For example: when we&apos;re not hungry, it&apos;s easy to plan on eating well. But when we are in the grip of hunger, those plans go out the window. "George Loewenstein once told me the key idea here is not that we have these hot and cold states, but that when we are in a cold state, we are terrible at forecasting how we are going to behave when we are in the grip of emotions," Shankar says. The researchers applied this idea to embarrassing situations. Many of us believe we can handle embarrassing situations. But when we actually are in an embarrassing situation, we fail to act with courage and confidence. "I think this plays a factor in Thanksgiving table meltdowns," Shankar says. "We think we will rise to the occasion to confront that proverbial drunk uncle Joe, but we fail to predict that when he actually starts acting up, we will lapse into silence." 3. Here&apos;s some good news: stuffing your face with turkey, gravy, and candied yams might have an upside. Arul and Himanshu Mishra — a husband and wife team at the University of Utah — found that on Thanksgiving, what&apos;s bad for your waistline might actually be good for your wallet. A few years ago, they interrupted 170 people on Thanksgiving evening — and asked those people how willing they&apos;d be to buy deeply discounted items. The researchers found that those who had eaten a traditional holiday meal were significantly less likely to be seduced by the discounts. And so, Dan concludes, "If you want to save money on Black Friday, pig out on Thanksgiving Thursday." 4. We&apos;ve known for a long time that children are easily distracted by bright shiny objects. Turns out, adults are, too – and this can be a very useful idea to apply at the Thanksgiving table. Martin Reimann at the University of Arizona, along with Antoine Bechara and Deborah MacInnis at the University of Southern California ran an experiment. They set up a food stand and told the volunteers that if they chose a half serving instead of a full serving, they would get a lottery ticket – a chance to win $100 Amazon gift card or 10,000 frequent flier miles. They measured how likely people were to choose the full serving versus the half serving with and without the lottery ticket. They found about two-thirds of the volunteers chose the full size serving without the incentive. But with the lottery tickets, that number dropped by more than half. If people thought they could win a prize, they ate less. If you want people to eat in moderation at Thanksgiving, or if you want to incentivize them to be civil to one another, offer them lottery tickets, Shankar says. Everyone who eats in moderation and behaves nicely gets a chance to win a prize. The Hidden Brain Podcast is hosted by Shankar Vedantam and produced by Kara McGuirk-Alison and Maggie Penman. Follow @hiddenbrain,@karamcguirk and @maggiepenman on Twitter, and listen for Hidden Brain stories every week on your local public radio station.